03.03.2005 - I am very pleased with this closeup photo of a handsome armadillo. Truly one of nature's loveliest creatures. Some like the colorful feathers of the peacock, or the happy smile of a bottlenose dolphin, or the cute fluffiness of a kitten, but no one can deny the rugged good looks of the Nine Banded Armadillo. Just look at that bright and inquisitive eye, or that smooth skin. How about that cute little beard, or those adorable feet? Some animals were built for rugged utility, and some were built for pure cuteness, and I have to say that the armadillo rates at least a 9.5 on the adorable scale. If you want a picture of an armadillo for your website, or an armadillo photograph for your bedroom wall or bathroom, I grant you permission to use this photo that I've taken. Just don't look at it for too long, or you could fall in love. Armadillo Photo Gallery: Visit my Armadillo Photo Gallery page for 24 high-resolution photos. Pictures And Information About Armadillos - The armadillo is a fascinating creature that originated in the warm swampy areas of South America, but is now a common animal that is found across much of the United States and Central America too. 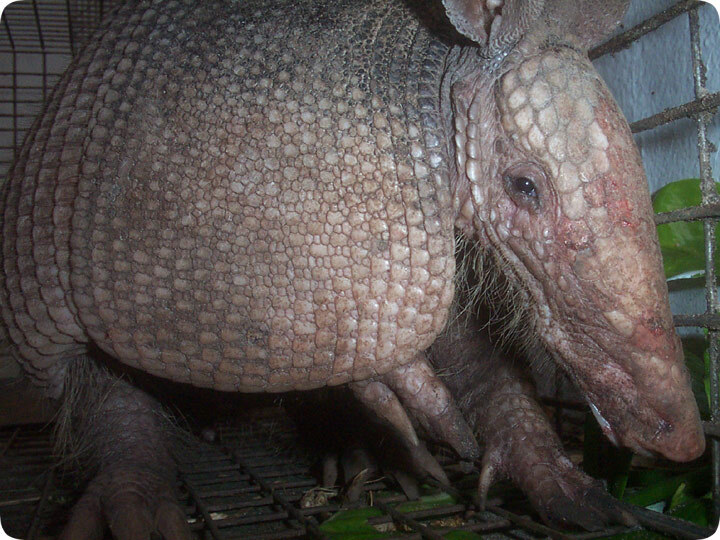 The most distinctive feature of the armadillo is the tough armored hide which is its most important protection from predators, and this is made of plates of bone that are linked together by a tough horned skin. This has meant that the armadillo doesn?t really have many natural predators in North America, and has helped the population to flourish in this area where it isn?t a native species. Armadillos aren?t always an animal that is welcome in many areas, as it can become a pest when it starts to root through garbage and is also known to dig up gardens and lawns looking for insects to eat. This is one of the reasons that there are many people who will actively look to get rid of armadillos or to prevent them from getting into their gardens in the first place. There are a number of excellent resources online to find pictures of armadillos, the most common of which is the nine-banded armadillo which is to be found across the country.